The screenshot above is hosted and provided by krksoft.com. Please contact them directly for any copyright infringement as we are not responsible for that content.
! Fix updating columns listed on some options.
! Fix configuration migration from v2.25.
! Fix reading AC3 properties from some MPEG files. 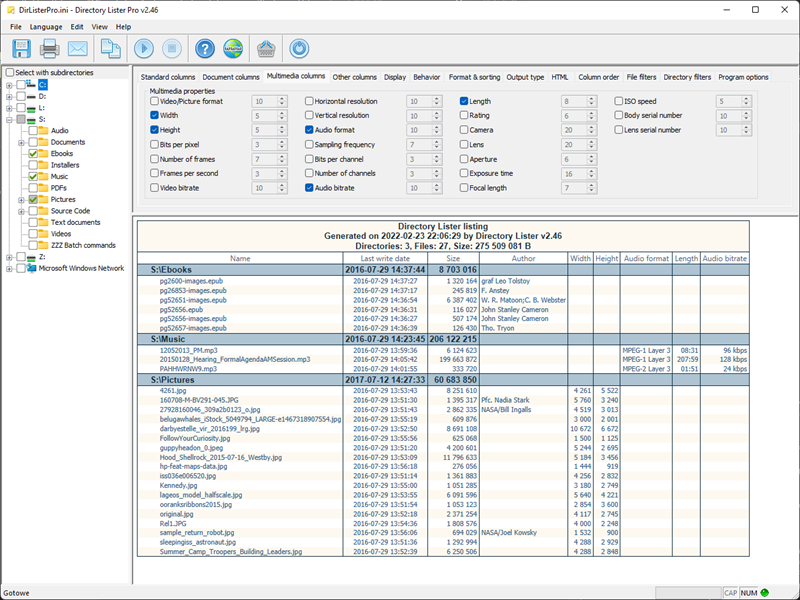 Directory Lister allows you to create, save, print, send via e-mail or store to database listings of files from selected directories on hard disks, CD-ROMs, DVD-ROMs, floppys, USB storages and network shares. Listing can be in HTML, text, Microsoft Excel, CSV format or streamed directly to a PostgreSQL, Microsoft SQL Server, MySQL, Firebird or Microsoft Access database. Also multimedia properties (MP3, AVI, WAV, JPG, JPEG, GIF, BMP, PNG, MP4, MXF) like track, title, artist, album, genre, video format, bits per pixel, frames per second, audio format, bits per channel can be listed. For each file it is also possible to obtain its CRC32, MD5, SHA-1, SHA-256, SHA-512 Whirlpool hash sum so you can verify the file has not been modified. Hash sums are also available for folders.